When you suspect that your plumbing is failing either due to leaks, low water pressure, or higher than average water bills, call the repiping experts at Integrity Repipe to replace the plumbing in your home or business with professionalism and skill. The experienced plumbing professionals at Integrity Repipe know just how important it is to have plumbing that works efficiently, so we pride ourselves in making sure that the pipes in your home or business are replaced quickly and cost effectively. For the best California repipe plumbers, contact Integrity Repipe. 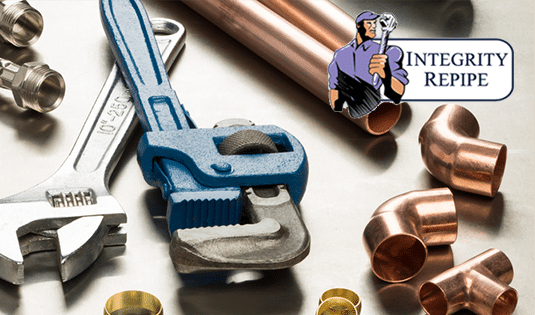 Integrity Repipe is a top rated pipe replacement company in San Diego that has the expertise and quality workmanship you need when having the plumbing in your home or business replaced. With five star reviews on Google and Yelp and an A+ rating with the Better Business Bureau, our trustworthy repiping experts are qualified to replace the pipes in your home. At Integrity Repipe, our qualified professionals can repipe your home and provide a variety of plumbing services to make sure that your home’s pipes are strong and working as they should. We provide copper pipe replacement, pex pipe repairs and replacement, leak detection services, and we also make sure that you understand the implications of your San Diego repiping and the extent of our offered services. Trustworthy and revered by all of our clients, our repiping experts in San Diego specialize in home pipe replacement for many materials, including galvanized, pex, CPVC, copper piping, and more. With affordable repiping services in San Diego, your plumbing will be in the best of hands with Integrity Repipe. Finding trustworthy repiping experts in San Diego who can replace the plumbing in your home is easy when you talk to the professionals at Integrity Repipe. Our five star client reviews on Google and Yelp speak for themselves. With specialty services like copper pipe replacement or PEX pipe repair, there is no one better to trust with your home repiping than Integrity Repipe. Backed by an A+ rating with the Better Business Bureau we provide the highest quality pipe replacements and customer satisfaction in California! For a San Diego repipe plumber near you, contact the trustworthy, hardworking experts at Integrity Repipe to get the job done right. With a variety of services offered as well as plumbing materials we replace, contact us today to find out more! Having your entire home repiped in San Diego comes with a lot of implications. At Integrity Repipe, our repiping experts can help you understand the necessity for repiping your home, whether it is to give you a more stable plumbing system, or lower your water bill, we are here to help. Although having the pipes in your home replaced may seem like a scary thought, it is a necessity when you want efficient plumbing that is free of leaks. At Integrity Repipe, we work to make sure that your pipes are replaced quickly and expertly, leaving nothing to chance. With non invasive leak detection, Integrity Repipe in San Diego is just the residential repiping company to take care of your leaky pipes and and full pipe replacement. For the most comprehensive home repiping services in San Diego, trust the professionals at Integrity Repipe. We provide a variety of plumbing services including copper pipe replacement and repair, PEX plumbing services, pin hole leak repair, slab leak repair, non invasive leak detection, and so much more. With free estimates for your repiping project, our technicians will take care of your home repiping in a reasonable timeline with care and efficiency. For more information about our service areas and other plumbing and repiping services we offer, contact Integrity Repipe today.